We got married on 4/28/18, which is the last weekend of ‘Wedding Season’, so we were able to take advantage of discounts with a few vendors. Right from the start, Kelsey was amazing to work with. She was helpful, patient, and bubbly. A few months later, she left the company and we were so nervous to have a replacement! Then came Brittani. She was also amazing- experienced, dedicated, and detailed. She is so friendly and eventhough she sees hundreds of couples- she really made us feel like we were special and our wedding was exciting. It is clear her main objective is creating the perfect event for her client. 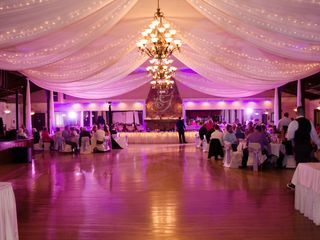 Springvale is a classy, traditional, vintage-style ballroom. The gorgeous wood floors, giant bar, high ceilings with draped tulle and chandeliers were exactly what we wanted for our wedding. The room set up for our wedding allowed for a huge dance floor. This venue is great for large weddings because it’s not crowded at all. Very accommodating. We went to a tasting and got to choose some menu items which were all delicious. We chose the chicken piccata and roast beef. On wedding day, the chicken didn’t have much sauce with it, so it was pretty bland. I was disappointed, but everything else was wonderful. They forgot to pour the champagne for the head table, so we had nothing to toast with. We were nervous about having enough bartenders for our crowd (a friend had said his daughters wedding had a line at the bar all night), so we sprung for a 3rd bartender. Not sure if we needed it for 220 people, but for sure there was no line at the bar. All of the staff was very friendly, efficient and accommodating. This reception hall was the perfect match for me! We were living over an hour away and planning our wedding in the area and the staff at Springvale made it seem like there was no distance. After we had already paid the deposit and reserved the hall they went through a change in management for the ballroom and there was a miscommunication when it came to the final pricing but they did right by us and we walked away with a beautiful reception. My husband was able to golf a few weeks after the event for free, as part of the package, and they took care of all the set up and tear down of the event. All we had to do was drop off a box of decorations the day before and the day after we picked up the box, so easy! I absolutely fell in love with Springvale the first time I saw it. And Kelsey was so great to work. She was there every step of the way and made sure everything went smoothly. She really did make the planning process so much easier and less stressful. The food was great and they have a food tasting event twice a year for the brides and grooms. They also work with a cake lady, Anne, who did an amazing job with the cake. I couldn't be more pleased with how our wedding day went at Springvale. I would highly recommend choosing them for your venue! Perfect wedding venue. Kelsey was phenomenal to work with. I would highly recommend to anyone looking for a reception hall. We couldn't be happier with our experience at Springvale Ballroom. We could not imagine our big day without the support of Kelsey and Vickie at Springvale. They were able to capture our vision and turn it into a dream come true. Kelsey was very responsive to emails and phone calls. She is also very accommodating to requests. Thank you Kelsey and Vickie! They were awesome, very accommodating and flexible! Helped made me feel relaxed with the planning. The big day was beautiful. Kelsey and the crew at Springvale helped to create a beautiful day for us! I live out of town and wanted a full service type of place and I absolutely got it with Springvale. 1) The ballroom is beautiful and I fell in love with it immediately. It was important for me to find a venue that was beautiful on the inside as well as outside as even though my plan was for an outdoor ceremony you can never trust Cleveland weather! We ended up having a beautiful day and did have the ceremony outside on the course and it was beautiful (tip: I reccomend a microphone if doing the ceremony outside - we didn't and while I think the guests could make out most of it I just wish I would have had that to ensure they did). 2) the cake made by Ann (included in the package) was amazing in taste and appearance and Ann is so sweet as she will make you a new top layer for your first anniversary rather than you eating the frozen one if you would like). 3) I was nervous about the food as I had some trouble at first finding items I enjoyed (tastings are set up to provide a plate at an existing event to give you an idea of what the food would taste like when cooked for large groups of people) - Kelsey and crew stayed patient with me and listened to the feedback I had to help create a final tasting that Only my groom was able to attend and from that the menu was decided. The food far exceeded my expectations the day of (we went with chicken Parmesan, pork with gravy, roasted potatoes, broccoli and perogis with onions). 4) Kelsey stayed flexible with me the week of and the day of when I decided to add a fry station to the evening and it resulted in her having to go to their vendor to pick up the supplies. She also was great in taking the decor items I bought and finding a place for them in the ballroom and outside and also flexible when I asked for the bar to reopen for a bit during dinner so my guests could grab one more drink before the bartenders took a break. It was also a great value! We got married at Springvale on August 13, 2016. I dreamt of an outdoor wedding but the day before the weather report made my mind up for me. Kelsey was amazing. She put together an indoor ceremony and reception that was stunning. I could not have asked for a more perfect day. Kelsey is a dream to work with. Any time I emailed her she responded right away. She took my bride jitters away any time I spoke with her. I told her what we would like and she made that and more happen. The food was beyond wedding food. Every guest I had complimented the food and the venue. Ann with cakes of elegance was also fabulous. The cake was great and just beautiful. 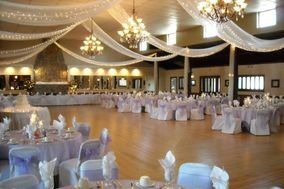 We highly recommend Springvale Golf Course and Ballroom and their wonderful event planner Kelsey!! Springvale was the absolute perfect venue for our wedding. The location was perfect being right around the corner from the mall, restaurants and hotels and the service was top notch. One of the biggest selling points for us was that we didn't have to clean up at the end of the night - they took care of everything for us. They would have set up for us as well had there been a wedding the day before - fortunately there wasn't so we could still set stuff up, but that was still reassuring to know we didn't have to get up at 6am the day of to set up. The food was excellent, the house provided decorations helped make the night and the overall persona helped make it a night to remember. Kelsey was a dream to work with - I always felt confident in her work and knew she would get the job done. She was extremely organized which helped me stay at ease during the planning process. I would highly recommend Springvale to anyone getting married in Northeast Ohio. Kelsey at Springvale was an absolute pleasure to work with! She was responsive to all of my emails and was so flexible! The venue was absolutely beautiful, and we received so many compliments on how nice our reception looked. The food was delicious and service was great as well! Looking back, I couldn't imagine having our reception at any other venue. Kelsey and the whole Springvale experience was so awesome! Biggest bang for your buck out there if you are looking for a rustic type venue with everything included for you. No need to order catering, tables, chairs, etc. Loved it! Springvale is hands down the best venue! They have it all - table linens/chair covers, a package with a wedding cake (ann from cakes of excellence), catering and bar packages. Everything was perfect. 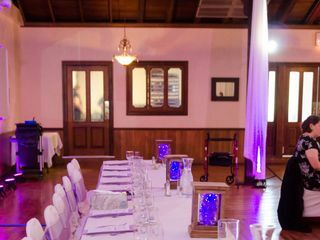 We loved the rustic charm of the ballroom. Kelsey, the wedding coordinator is absolutely amazing. She is very responsive to emails and phone calls, answers every question your have and is very organized- she helps you with every step along the way with your big day. The Thursday before our wedding I dropped everything off to her (all of my decorations for the ballroom). When my husband and I got there Saturday for our reception, we were absolutely speechless. Everything looked amazing! Kelsey and her staff set up everything that morning. That was one really nice thing about springvale, along with everything else. The food was amazing. Everything about the night was perfect. 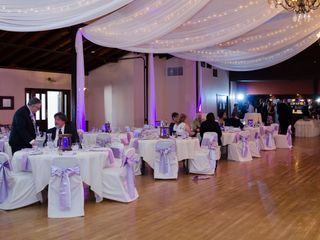 Stop your search here and book springvale ballroom for your wedding reception, you will not be disappointed! Kelsey was great to work with and very flexible to accommodate any request! We had an absolutely perfect wedding ceremony and reception at Springvale Golf Course and Ballroom! Kelsey was our wedding coordinator and was phenomenal! She answered e-mails quickly, was very flexible with meeting times/days, took care of everything for the big day, and has such a wonderful personality! She also has been a coordinator for some time and really knows what she is doing. Kelsey is very knowledgeable and will do anything she can to make your event exactly how you're picturing it. I definitely would recommend this venue and wedding coordinator for weddings, but also think Springvale is an absolutely beautiful venue for other parties or events too. Thank you for making our wedding such a wonderful day! Kelsey was great at helping us plan our wedding. She made us feel comfortable that everything would run smoothly the day of, and it did! The venue is beautiful and the food was excellent! We got so many compliments from our guests about Springvale, and I would definitely recommend this venue for anyone looking. Our wedding day at Springvale was absolutely perfect! Kelsey was so easy to work with and had so many great ideas. She took our vision and made it possible. We couldn't have asked for a better day! 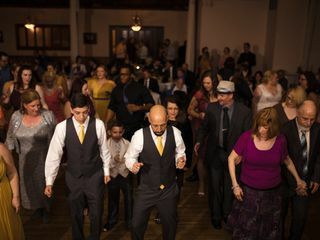 We can not say enough about how fabulous our wedding reception was at the Springvale Ballroom. Kelsey is a wonderful wedding coordinator as well. She answered emails and questions promptly through out the entire planning process and was always willing to meet and assure us we would have a perfect day. She let us have multiple food tasting until we found the perfect choices and made sure everything was set up perfectly the day of the event! She is extremely professional and I would highly recommend her and this venue to any Cleveland bride!! The decor is stunning with hard wood floors and a giant fireplace. Everything is in one room at this venue (bar, dance floor, dj, guests) so that no matter where you are enjoying the party. The food was delicious and there was never a wait for our guests at the bar. The bartenders were also very nice and started remembering what each guest was drinking when they returned for a refill. Go check out this hidden gem in North Olmsted. Kelsey was amazing at handling all of the details for our wedding. Every question was answered promptly and she helped to make our day stress free and beautiful. Kelsey from Springvale did such a wonderful job on our wedding. Everything ran smoothly and the venue was decorated the way we had imagined it to be. I would recommend this venue to any bride who is looking for a historic/rustic/vintage/elegant wedding! My husband and I toured quite a few venues in Greater Cleveland but none of them compared to Springvale. Springvale had everything we were looking for and more. We planned our wedding from 2,000 miles away and Kelsey and the rest of the staff at Springvale helped to ease the stress of long-distance wedding planning. I appreciated how quickly Kelsey would respond to my emails and her flexibility whenever we decided to make changes. The beauty of Springvale is unparalleled anywhere else. Our photographer was able to take some lovely photos both indoors and outside on the golf course. The staff turned the ballroom from the ceremony set-up to the reception set-up in almost no time at all. The food and drinks were fantastic and I was happy to see that our guests never had to battle a crowd at the bar due to quick and friendly service! On a more practical note, Springvale is also very affordable and the packages include everything you need! Thank you, thank you, thank you for making our wedding so special! Springvale Event Coordinator, Kelsey M., and her staff did an amazing job for our wedding! The hall was absolutely stunning, the food terrific and service exceptional. Our guests are still raving about the kindness of Springvale employees, how delicious the meal was and how nice the hall looked all thanks to Springvale's expertise as a leading venue in the Greater Cleveland area! My wedding turned out wonderful and the Springvale staff (Especially Kelsey, the event coordinator) was amazing. The room itself is beautiful and you don't need to add much to make it even more so. I used my own centerpieces, had special snowflake curtains to hang, a Hot Chocolate Bar, a few uplights to highlight the fireplace, and more and they handled it all with ease and everything looked just the way I wanted. They were very flexible with food (we had 1 vegan and he LOVED his stew) and seating (allowing us to squeeze 9 at a table instead of 8 when we really wanted cousins/ family to sit together) and the food was really good. I also loved that you could attend more than one tasting to really be sure of what you wanted- and they were free! I also loved the Cake- it was gorgeous- and the cake vendor ANN was included in the package at Springvale. All of my friends and family really enjoyed the event. I would definitely recommend Springvale to any bride. I cannot recommend Springvale Ballroom enough. I cannot say enough nice words about Kelsey. Kelsey was always quick with an answer and beyond helpful. She was present for the rehearsal, arrived prior to the ceremony, and stayed late to make sure it all went according to plan. Seriously, my eyes and ears while my bridesmaids and myself were hiding out in the back room. She and her team did an amazing job of setting everything up and changing over from ceremony to reception within 10 minutes. She ensured everything was perfect and it was! Prior to the ceremony, she got my husband and his groomsmen some beers and coffee while they were waiting. Ensured I had everything I needed and got the ceremony started within 5 minutes of our planned start time. If anything went wrong, I have no idea. And I still have no idea. I couldn't have envisioned a better wedding and I can't imagine having to get it all done without Kelsey. Seriously, stop looking. Springvale is your venue. 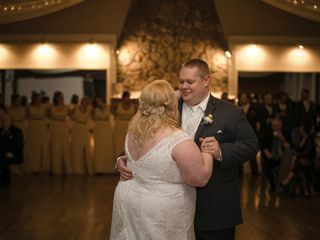 I worked with both Kelsey and Sarah at Springvale Ballroom for my wedding in November 2014 and they both went above and beyond each step of the way. Working with Sarah on package choices and decor was a breeze. She explained everything in a really easy to understand way and was very accommodating with special requests. She was also always available and comforting when I had concerns. Working with Kelsey on the final details was amazing – she also was very comforting and accommodating of last minute concerns and set my mind at easy before the big day. On the day of our wedding, she was on top of everything, making sure the details were perfect and the reception went smoothly. 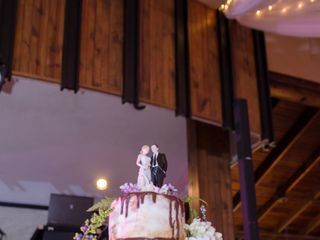 Springvale Ballroom was the perfect choice for our wedding - from the beautiful wood floors, vaulted ceilings, spacious bar and retro band stand. The food was great, drinks were flowing and the prices were right. 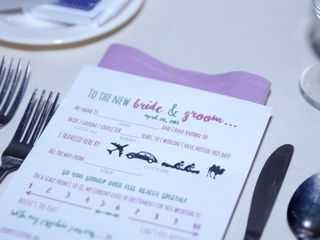 They were accommodating of special requests in decor, timing and package choices. Check out Springvale, it just might be the venue for you! I couldn’t have asked a better vendor in Springvale Ballroom and I could not recommend both Kelsey and Sarah enough! Our wedding was perfect. Kelsey and the Springvale crew were extremely easy to work with and very accommodating. They took our wedding vision and made it into reality!